Crasner Consulting takes a look at 2018’s lateral movements and investments in Germany, and analyses why some firms struggled to move the needle. 2018 was an active year for international law firms in Germany, both in terms of growth and office launches. Much of this growth and investment was centred on bulking up Corporate and Finance capabilities. According to Handelsblatt, in the first nine months of 2018, German companies announced deals worth a total of $216.9 billion (€184.7 billion), a 137 percent increase over the same period in 2017. Germany followed the global trend of strong M&A activity and it was, overall, a very buoyant year for the country both in terms of inbound and outbound investment. Furthermore, 2018 marked a landmark moment where unemployment rates in Germany hit their lowest rate since reunification in 1990, which consequently became the anchor of a major consumer-led upswing. This, combined with strong export trends and favorable market indicators driving investment activity across the Mittlestand community, supported a very strong year economically for the country, which translated into a prime environment for law firm growth. That said, after a strong start, tough emission tests affecting Germany’s strategically important automotive industry, and falling exports triggered by rising global protectionism, resulted in the economy shrinking by 0.2% in the third quarter of 2018, according to The Guardian. The backdrop of the German economy is a clear indicator as to why lateral hiring and law firm growth was a lot stronger and more frequent in the first half of 2018, than it was in the the 2nd. As the flow of cross border deals increased, international law firms’ thirst to achieve critical mass in corporate, finance and all necessary ancillary practice areas in Germany, to service these deals, was exacerbated. In addition to increased deal flow, the UK’s exit from the EU (“Brexit”) also shifted law firm focus to other EU countries, namely Germany. With Brexit on the horizon, Germany is playing an even greater role as the strongest economy in the EU. With multiple corporates and banks (for example Goldman Sachs & Morgan Stanley) shifting a greater percentage of their operations to areas such as Frankfurt as a precaution for the somewhat unknown effects of Brexit, law firms are seemingly seeing the need to follow suit and grow in these cities. Latham & Watkins – Hired Thomas Grützner, White Collar Crime Partner from Baker McKenzie in Munich. Orrick – Hired Christine Kraniak, an acquisition finance Partner from Kirkland & Ellis into the firm’s Munich office. Which law firms are in the race for talent in Germany? It’s clear from the table above, that US firms are leading the race for talent in Germany. These include the likes of Reed Smith, Hogan Lovells, McDermott, Latham & Watkins and DLA Piper, all of whom continue to be acquisitive and show appetite to further bulk up across the country. UK firm’s on the other hand are somewhat more inactive, in comparison, with significantly less lateral investment to date. In 2018, Hogan Lovells showed their renewed commitment to Germany as a strategically crucial jurisdiction in terms of both revenue generation and for decision making. In particular, the firm elected Hamburg based Partner Leopold von Gerlach as the new firm wide global Chairman, at the same time as creating an all new ‘Managing Partner of Germany’ position, to oversee all of the German offices and operations (Germany makes up over 50% of Hogan Lovells Continental Europe revenue). On the flip side, the likes of Gibson Dunn and Mayer Brown, are yet to join the race for talent in Germany. 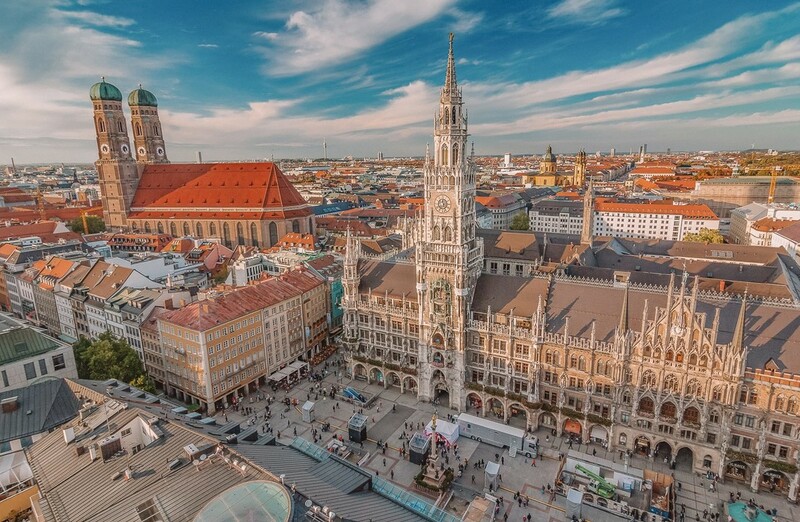 This is due to the high profitability of Gibson Dunn and the issue of relatively low rates in Germany, which prevents the firm from growing extensively. Nevertheless, the firm continues to be one of the highest profile, leanest and profitable practices active in the market. Mayer Brown on the other hand, has different challenges in Germany. 2019 will see Germany continue to be a major recipient of investment by global law firms. While the number of moves is likely to slow, the strategic importance of the lateral hires will increase as firms fight for top talent and compete aggressively to secure sizeable and prominent corporate and finance teams. 2019 is also likely to see new entrants into the market from firms like Cooley, who are investing significantly in Europe. It will also be the year where battered outposts of international firms in Germany disappear, particularly smaller offices of law firms who are investing in the US and London and see Germany as less strategically important. It would also not be surprising to see some of the big-name firms such as Milbank Tweed Hadley & McCloy, make one or even two very high profile hires in 2019. Whilst 2018 was quiet for Milbank on the lateral hiring front in Germany, as they focused their attention on London in the early part of the year, the firm continue to be one of the most profitable operations that exist, executing some of the highest profile transactions in the market. They are also known for making statement hires, for example taking Steffen Oppenlaender back in 2017, which was a hugely rare exit from Hengeler Mueller and arguably remains one of the most prominent lateral moves of recent time in Germany. Crasner Consulting is a pre-eminent force in global legal search & consulting. 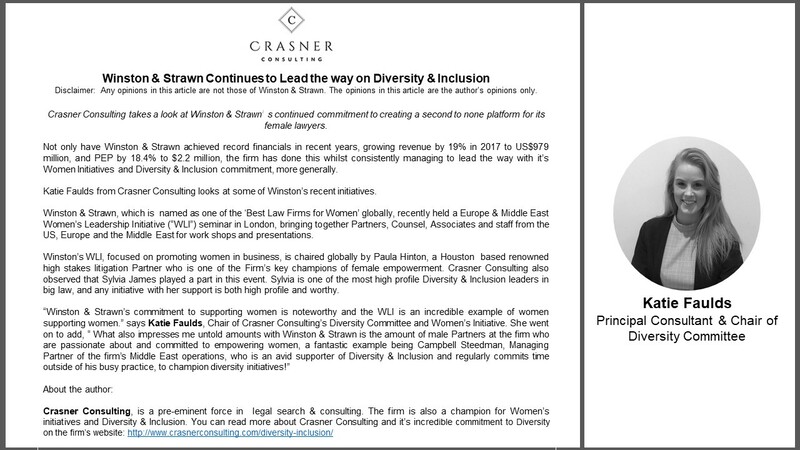 Headquartered in London, Crasner Consulting has considerable experience helping the Boards and Management Teams of US and UK law firms to launch and build their operations around the world. Katie Faulds leads Crasner Consulting’s highly respected German practice. Ms. Faulds has advised a number of the world’s most prominent international law firms on their strategy and expansion in Germany. Ms. Faulds has completed retained searches to launch offices, recruit Partners and / or recruit sizeable teams. Ms. Faulds is a fluent German speaker and part of a team of the worlds most experienced search professionals for large scale deals. Ms. Faulds and the Crasner Consulting team has an enviable track record for office openings and major team acquisitions in Continental Europe, the Middle East and Asia. In addition to her practice, Ms. Faulds also heads Crasner Consulting’s Women’s Initiative and Diversity Group.